When you visit Hawaii, you must go to at least one luau. To miss it would be like going to Paris and skipping the Eiffel Tower. Some of the best luau food and Polynesian entertainment in the Islands can be found at “commercial” luaus. These guys are in business to make sure you have a great time! We’ve put together a list of recommended luaus on each island. Preparations for cooking in the “imu” are begun early in the morning of the day of the luau. A large pit is dug in the sand. Kiawe logs are placed in the bottom of the pit and topped with river rocks. A fire is started and after a couple of hours, the hot coals and hot rocks are ready for the next step. The rocks are evened out on the bottom of the pit and moist banana stalks are placed on top followed by a bed of banana leaves to put the pig on. The pig, sweet potatoes and laulau are placed in the imu and covered with more banana leaves and ti leaves. Usually several wet burlap bags top this to add steam and keep the heat in. A tarp of some kind is then placed over the whole affair and then the pit is covered with sand. After 6 to 8 hours of this steam-cooking, the kalua pig is ready. Most have an open bar where you can find Mai Tais as well as other tasty tropical drinks, and children get a bright pink fruit-punch or soft drink of their choice. Be adventuresome and try all the unusual foods you’ll be served. There’s sure to be plenty that you’ll find delicious. We must admit, we have our favorites on each island. Click on the island you’re interested in to read about our picks. Once you’ve found a luau you like, you can click on the link to read more about it and go to a reputable site where you can make reservations and buy tickets. 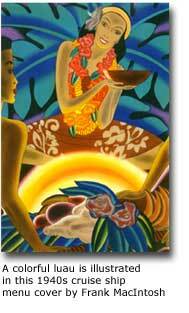 It’s a good idea to book your reservations in advance as seating is limited and the popular luaus sell out fast!